Whole-body cabins, consisting of 4 panels, which allow exposure to the whole body using only a minimal footprint. Wall-mounted, one of the panels is fixed with 4 dowels (10 mm), while the other 3 rotate, so as the entire equipment is able to flatten against the wall when it is not in use. The overall dimensions on the wall are the same for all models and require 210 cm in height and 120 cm in width (150 cm for the models with 40 and 48 lamps), with only 22 cm of depth engaged, which become 75 when the cabin is open. The various models differ in the number of lamps supplied (only Philips TL01 100W lamps are installed). The models with 40 and 48 lamps are 25 cm wider than those with a lower number of lamps and the depth of the open cabin is 90 cm. Body made of 10/10 sheet metal, powder coated in grainy RAL 7035, mounted on wheels. Internal trays in 10/10 stainless steel. Inner surface in mirror finish stainless steel. Electromechanical power supply system and starter (electronic ballasts available as an option). Cooling fans to keep the lamps at constant temperatures. Safety guards for the lamps. 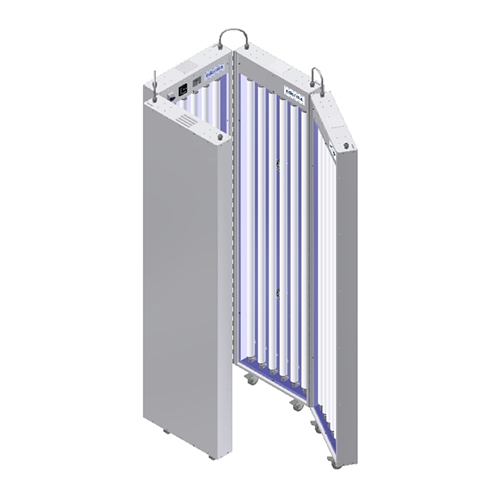 Single panel with two doors, hinged to the panel on the vertical axis and mounted on pivoting wheels, to allow for a perfect radiation on the sides as well. The treatments thus obtained represent an almost equal mode to those carried out in a cabin but one part at a time (front/back). It is a practical and economical solution that still allows the user to undergo treatments on the whole body, including the hips, in few minutes and in optimal irradiance conditions. The models of the 103 series are characterized by a unique design, compact and portable, so they can be inserted into any living environment. The equipment (using Philips TL01 100W lamps) are fixed to the wall with two anchors. The mod. 103.12 is the best seller, ideal for body sizes medium (up to 70 kg); for the more robust is better directed on the models to 16 or 18 lamps, wider than 12 cm. The number of lamps influences the irradiance, which is why a greater number of lamps will mean shorter exposure times; even in models with a minumum of lamps, exposures are still obtained in a few minutes.